(3 stars) Works, but has issues. Driver installation was difficult. If you purchase more than one of these cards, interchanging them across different PCs wont work. Each card comes with an accompanying CD and you MUST install it's paired CD on your computer to use it. This seems to be a very sloppy method to install product drivers. The unit once installed properly does function as a set of two USB 3.0 ports. I use it to interact with a USB monitor adapter and have not had any issues for 2+ years running. The external jack seems to be broken as I was trying to run a USB3 vision camera with this card and did not have any luck. This was when I wired the external power cable to a phone charger for power. External jack is broken? All in all this product works, but it has its hiccups. (4 stars) very good support service! My unity doesn't works at all and driver never could be installed. After a very poor review , the support service contacted me and in a brief chat by e-mail they fixed the problem, so my unit now work at the best . Thank you! 4 stars because the driver not installs automatically on dell 640M with xp sp3 (italian releasing). For the support 5 (FIVE!!!!!) stars!!!! 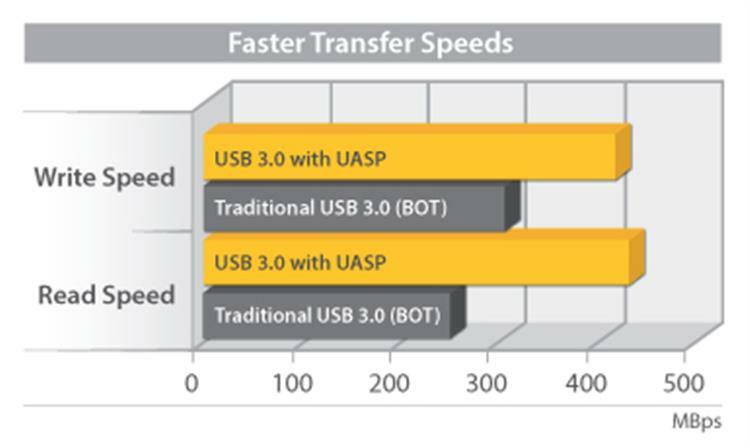 This card's USB 3.0 port transmits data slower than PC's USB 2.0 port. 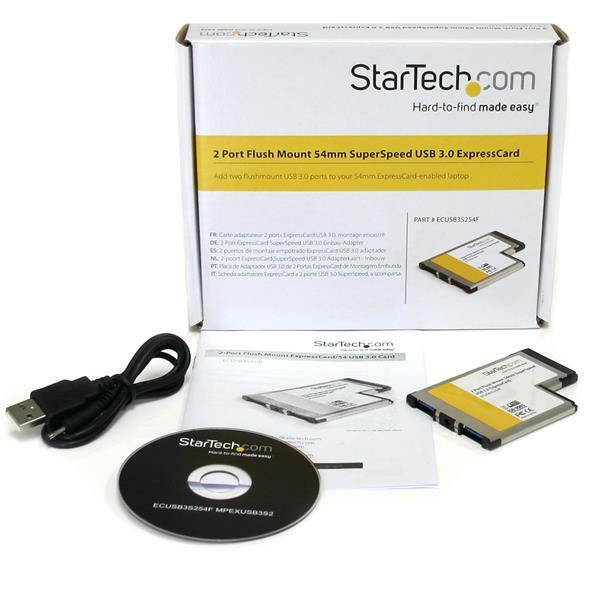 I just received this earlier and it installed without issues using the drivers i took down from Startech. 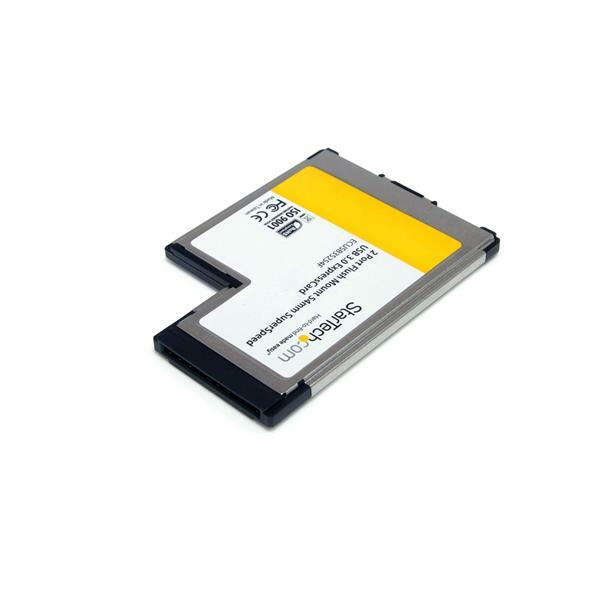 The speed is noticeably faster than the USB 2.0 ports and makes using this card a good choice. Arrived today!! 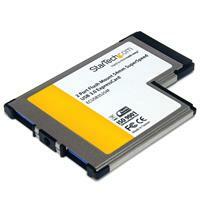 StarTech 2 Port Flush Mount ExpressCard 54mm SuperSpeed USB 3.0 Card Adapter Up and running within seconds. The answer to all my USB problems. My lady needed to do an important report and needed to use a USB key. No problem, StarTech worked like a dream.